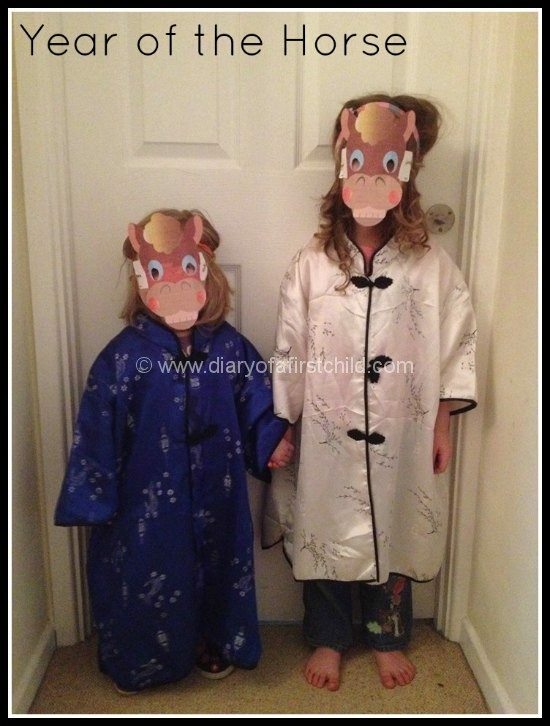 The Chinese New Year celebrations begin around the world this week, and while we have no actual reason for ‘celebrating’ Chinese New Year, I thought it would be a fun theme for this week’s Play Learning. The day on which New Year falls differs between January and February depending on the Lunar calendar, and celebrations last for 15 days. 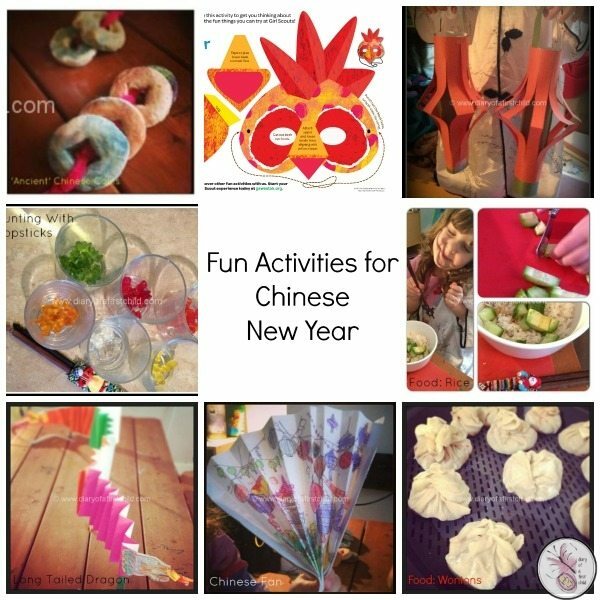 While it doesn’t hold any spiritual or otherwise significance for us, Chinese New Year gives us the opportunity to do some crafts, learn to use – try at least – chopsticks, and learn a few tidbits about life in a different culture – different alphabet, ancient coins, different dress, even different music. We discussed silk production, China as a mass producer for the world, and much more. You can find the instructions for these lanterns here. My kids wanted to set fire to them, and put candles in them. I’m not sure that’s a good idea, but they were very proud of their lanterns irrespective, and spent a lot of time walking around holding them. 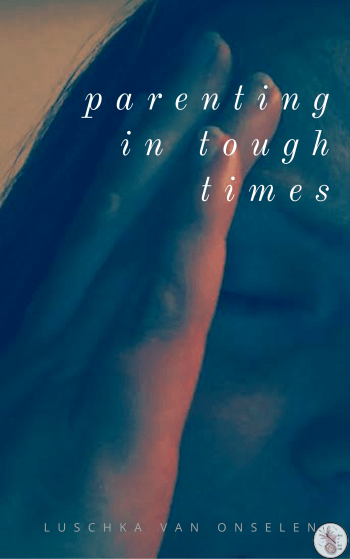 A quick and easy winner of an activity. I am assuming these are Chinese letters saying Happy New Year. That is what I Googled! Another activity the children really enjoyed, although to be honest, I did most of the work, was cutting out ready-printed horse masks. So, this activity did not work out as planned. We were meant to make balls, stuffed with cucumber and learn to use chopsticks in the eating of them. 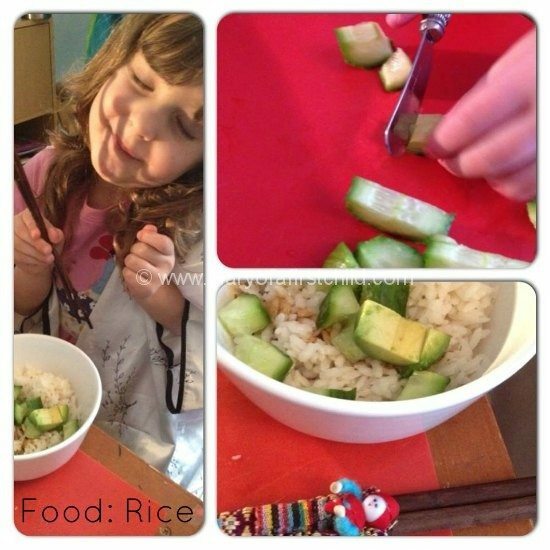 The children cut their own cucumber, but I used arborio rice rather than sushi rice and I’m not sure if it’s a less sticky, perhaps, but it didn’t work out. So we ate a bowl of rice. It was a fun family activity, anyway. Here’s the original rice ball recipe for you, maybe you’ll have more luck. I must admit, this was a super fun activity! We used salt dough, rolled out, the stamped circles using an egg cup. Using a decorator thingy we made squares inside the circle, and popped them in the microwave. Our microwave is the most unused item in the house – it just stands there, but it is useful for fast cooking salt dough – from dough to dry in around 3 to 4 minutes. Perfect for toddler. We then painted it. The coins should really be gold or bronze, but in pre-school world, pink, blue and green money is worth a whole lot more, didn’t you know? 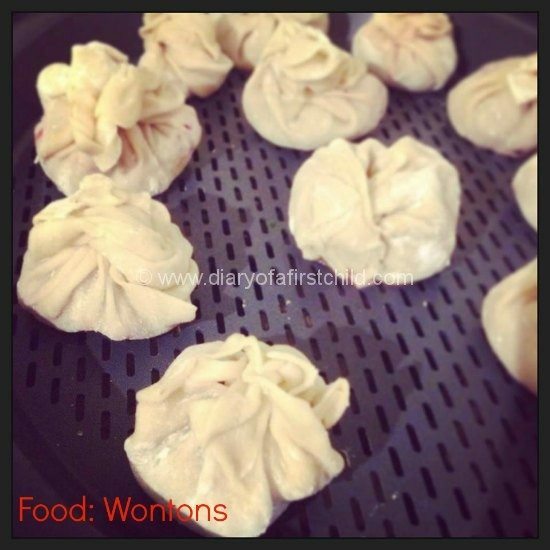 There are loads of Wonton recipes online, or you buy some wrappers and just fill them. 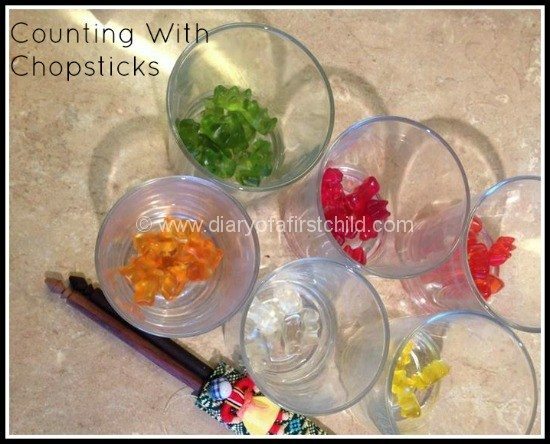 Great activity for little ones, I think – scoop and twist. Easy peasey. 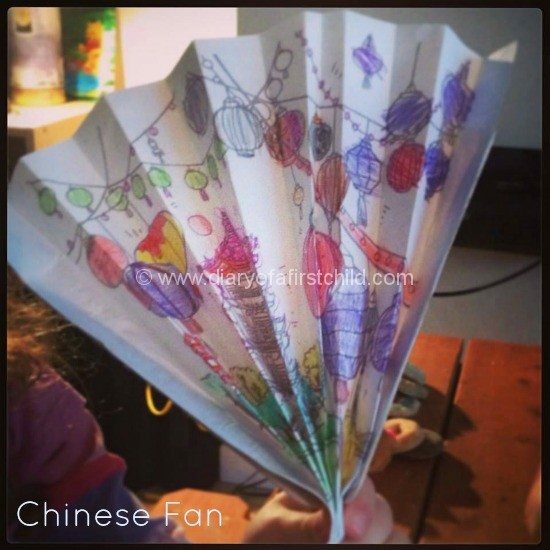 Fans are just as easy to make. 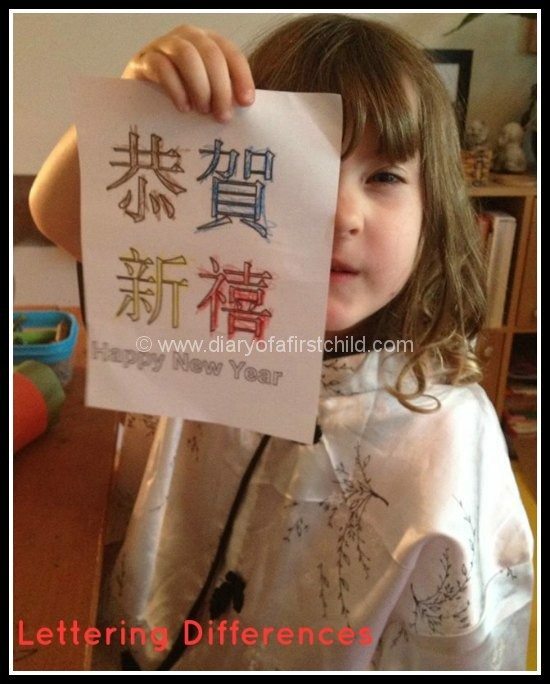 First we printed off a colouring picture of a Chinese Lantern Scene, and coloured it. 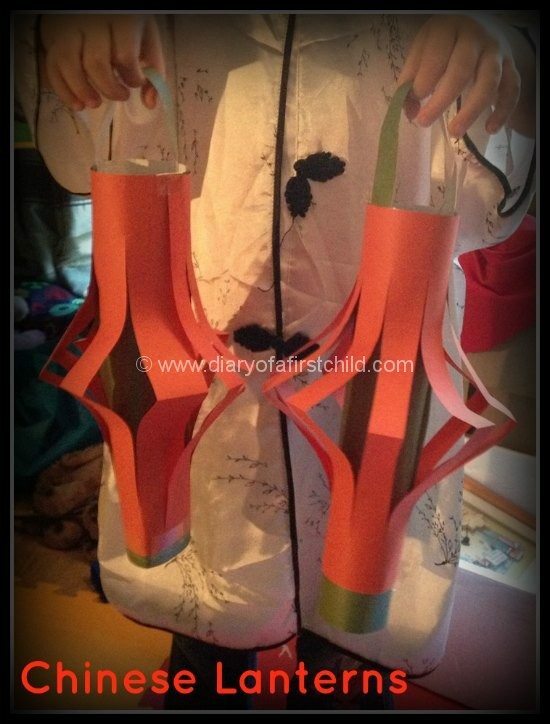 Next, we glued two popsicle sticks to the short ends of the A4 page, then folded the paper in a zia-zag pattern, before gluing together the bottom zig-zags, and opening the top, thereby making a fan. The dragon was superb fun. We cut A4 pages in half, lengthwise, and then in a similar fashion to the fan above, zig-zagged the dragon’s ‘body’. We glued the body parts together, and cut thin strips for the tail, which we tapered down to – you can just about see it in the picture. I tried to draw a dragon head, but was told it looked more like a mouse… or maybe a hand. So I went back to the Internet, where I found a printable dragon head from Red Ted Art. So we used that, and again tapered the pink paper so that the joining point was the same size as the printed dragon head. Next we took tiny bits of orange and yellow, and curled them around a pair of scissors, before glueing them to the mouth, for flames. 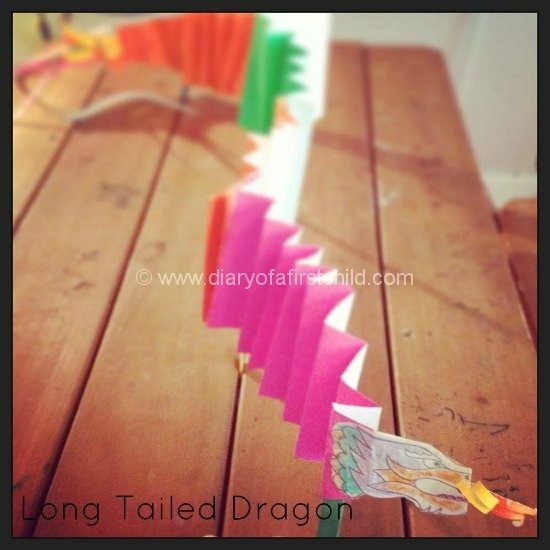 Finally we glued four popsicle sticks to the bottom of the dragon so that we could ‘dance’ and ‘fly’ our dragon around. I think this was Ameli’s favourite activity! I wouldn’t normally go out of my way to have this kind of sweet in the house. I think they’re really hard to digest, among other things! But, we were trying to learn how to use chopsticks, and also doing some basic 1+1, 3-2 mathematics. Ameli spent more time laughing about the silliness of chopsticks than much else, but it provided a few giggles, which is always nice. This was also a lesson in full instruction giving. I told her she could eat whatever she could get in her mouth using chopsticks. About a minute later she was using two hands to grip the sweets into her mouth, then decided that was too much effort, so started randomly stabbing teddybears with a chopstick. Clearer instructions next time, methinks! We used to make peasant hats as children, but I have no idea why! I guess we liked the hats! They are pretty easy to do. Cut a large circle from an A3 sheet. Cut from one point into the centre. Decorate the circle, then overlap the cut ends, till the hat is in the right shape. You can attach some string underneath too, to pop under the chin and keep the hat secured on. A globe is a great tool to have. We only have an inflatable one, but it does the job. It’s a great opportunity to ask leading questions and have a discussion on everything you’ve done in your crafts. What kind of food do they eat, what music do they like, what do they celebrate, how are they different to us, how are they the same as us…. The Internet has revolutionised learning, and homeschooling particularly! There’s just nothing you can’t find on it these days! Find Chinese traditional music on Youtube. You can also find loads of dragon dance demonstrations – we loved this one with the lit up dragon. Just a simple Google of ‘Chinese New Year Celebrations‘ should give you some idea of whether there are any celebrations in your area. If you’ve never been, they are normally loud, colourful and an adventure for the senses – a highly recommended activity!